Although you do not always forget your Windows login password, there is a salvage tool available, as the introductory article below might be useful for you at some point. When you forget your Windows login password, the only way to fix it is to reinstall Windows. However, this is not the only way. If this is the case, the article below can help you solve this problem. Offline NT Password & Registry Editor is a tool that allows you to solve this problem in a quick and convenient way. With the help of this tool, the Windows product key logon password will be removed and users will be able to access Windows without having to log on the password. After installation, at the main interface, select Burn ISO Image, click OK. A new dialog box appears, click on Browser, select the extracted ISO file, and then click Burn Disc to burn the file to a blank disc. - Open the computer, click the Delete key on the keyboard (sometimes the F10 key). - The BIOS interface appears. Here, look for the Boot entry, the list of boot device devices listed. - Press the +/- key on your keyboard to bring the CD-ROM drive to the first position in the list. - Press F10, select Yes to exit the BIOS and save the settings. Note: Each BIOS has a different interface and joystick, but most are the same as the instructions above. In some cases if something goes wrong, for example, the boot process takes too long, you can try pressing the Enter key on the keyboard to continue. The tool will need some information from the user before proceeding to clear the Windows logon password. In the first step, the tool scans your Windows hard drive partition, and then creates two new partitions: one for booting, and another for the whole system. Information about 2 partitions will be displayed on the screen. The first partition named sda1 has a bootstrap function, and the second partition sda2, which contains information about the system. Next, we will begin the scan of part 2 (containing system information), to find the necessary information in the registry. Once the process is finished and the mouse pointer appears, press Enter to continue to the next step. The tool will list the registry keys. Press the spacebar (long key on the keyboard) to reach the end of the list. Press 1 to select the password recovery function. In the next step, press 1 to select "Edit user data and passwords". The list of Windows accounts will be listed. You can choose to change the information of any account, but it is best to change the information of the Administrator account, to be able to log on Windows and use the full rights. Type the name of the account you want to select. (Here is the Administrator). Next, press 1 to delete the existing password on this account. - Press "!" And press Enter if you do not want to continue deleting the password of other accounts. - Press "q" and press Enter to exit. You will be asked if you want to save the process. Press "y" then Enter to save the changes. Otherwise, press "n" and press Enter, the above process will be canceled and you will have to restart from the beginning. The tool will ask you if you want to redo the process from scratch. Press the "Ctrl + Alt + Windows" product key (the Windows logo key is between Ctrl and Alt) to exit, and restart Windows, using the account that has been removed for login. Yesterday, the US software giant has confirmed plans to officially release the next-generation operating system on October 22. 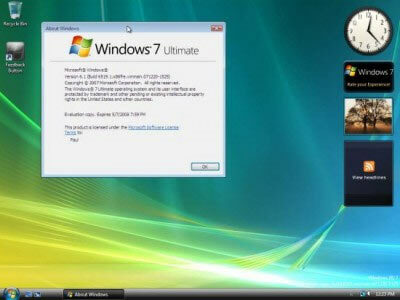 Buyers of Windows Vista software will be offering free or discounted Windows 7. To reach this milestone, Microsoft office 2013 product key will end the software development phase by mid or late next month, vice president Bill Veghte said in an interview. "The user has responded very well to the last RC release (Release Candidate) of Windows 7." Right after the launch of the RC near the end of Windows 7 last month, Microsoft has confirmed plans to release the operating system before the holiday shopping season. Phil McKinney, GD Technology of HP Computer Manufacturing, also expressed confidence that Microsoft will launch Windows 7 home premium product key as scheduled. Microsoft said it would give preference to those who bought the Vista operating system close to Windows 7. Accordingly, Windows Vista buyers will get a free copy or discount of the new operating system. Similar to previous programs, the discount or free will depend on the manufacturer of the computer. Microsoft's intent is to apply this program to Vista Home Premium and premium versions. However, the program will not perform as soon as Windows 7 launch, but Microsoft promises to release a number of cheap upgrade for those who used Windows product key. Windows 7 will be available in five different editions, including Starter, Home Premium, Professional, Enterprise and Ultimate. Windows 7 Basic will be available in emerging markets. The selling price has not been announced. The "blue screen of death" is an obsession for computer users, and it is still present on Windows 8, although the frequency is less than it used to be. Blue screen of death (BSOD) is a term often referred to in Windows 98, Windows XP product key and even Windows 7. This screen usually appears when a serious error occurs that makes full. System kits stopped working immediately. In Windows 8, this phenomenon is less likely due to the new technology that Microsoft applies. However, if a bad day, you suddenly encounter this error in Windows 8, then below are measures to help you overcome this phenomenon. If you can not find any information related to the problem you are experiencing, do so yourself, or more precisely, use the troubleshooting tools available in Windows. First of all, keep in mind that recently you have installed a piece of software or a driver for your hardware. If so, the cause is that the driver is out of date, or the software installed has conflicted with the old software in the machine. In this case, go to Windows using Safe Mode and try removing these objects from the system. Alternatively, you can go to the manufacturer's website, download and install the latest version for these objects. If this is the first time your computer encounters a blue screen error, you can use the System Restore feature in Windows product key to restore system files to the time before an error occurred. This feature does not delete or change individual files but only affects system files. Also, if you suspect your computer is infected with malware, install anti-virus software to remove them. Although not appreciated, the Windows Defender tool available in Windows 8 can help you do this. If you are more thorough, you can use bootable tools, such as a BitDefender Rescue CD or Avast, to scan and review your system without going to the operating system, spread to the computer from the root. If that does not solve the problem, Windows 8 product key also has a final block, which is the Refresh function. After using this feature, you will have a clean, clean operating system, no malware, and potentially conflicting software. Now you just need to reinstall the software that you usually use. If you have tried all of the above and you still have "the problem", then the problem is not software, but hardware, such as faulty RAM, CPU overheat, or internal components. Broken ... If you are familiar with hardware "vóc", open the machine and check for a view with unusual signs. And if you do not have much experience with the hardware then there is no other way, the computer repair shop is the last solution for you. Good luck! Memory management error Windows 10 is a common problem nowadays in Windows operating system 10. Memory management error in Windows 10 also known as BSOD is called blue screen of fatal error in Windows 10 product key. In article In our previous article we discussed how to fix Windows 10 Blue Screen of Death. We can not be bound on a single statement that this is the cause of the Windows 10 memory management error as there may be many reasons. Error handling Windows 10 errors can also have many types. Here we will introduce famous and working tools to scan your Windows 10 and solve the problem of memory management Windows 10 error which is also known as blue screen of Windows 10 dead. and Windows 10 memory management settings bugs have many similarities in the sense that there can be many reasons. There are many anti-virus software available that can help you scan your Windows 10 product key. We recommend that you choose one of the anti-virus software from the article above. Next, here we are on our promise and introduce you to the software to scan your Windows 10 and get from How to Fix Windows Memory Manager 10 Error. Download Reimage Plus and solve your problem about windows memory management error 10. Once you have installed this software, click Scan to fix all Windows 10 issues. Fix your PC to fix all the errors related to memory management in Windows. Go to Start Menu in Windows. Enter Command Prompt and open it. Write this command SFC / SCANNOW. Note: The Command Prompt must be open as Administrator. Right-click the command prompt, and then click Run as Administrator. Running as administrator is required to correct Windows 10 memory management error. It will scan your entire system and of course take time to test Windows 10. If the above solution does not work and you think the SFC command will take longer. Then there is a best solution to repair windows memory management error 10. Go to the Start Menu (Search bar). Open up this free diagnostic tool of Windows 10 to solve Windows 10 errors. Click Restart Now and Check for Possible Problems. Note: When rebooted, it will take time if something is getting wrong with your RAM or hardening then the Windows 10 tool to detect this problem solved. Do not worry if it takes some time to let you know the possible causes of the errors and fix the Windows 10 memory manager. There is a well known Cc-cleaner software that helps you fix the registry in Windows 10. Now the question is how the registry fix can solve the Windows 10 startup memory manager error? The CC cleaner will help you fix all your Windows 10 logs. After you successfully repair the registry from Windows 10 with the suggested tool, run the scan. It will resolve the memory management error while installing the windows. Go to Command Prompt (Make sure to run as Administrator). Write the SFC / SCANNOW command. Wait until your PC is scanned and resolved How to troubleshoot memory management Windows Error 10. If you still have any problems resolving the memory management error window 10, please contact us and share this article on the social networks given below. Thanks, We appreciate your feedback.